Over 116 million visitors came to Florida in 2017, no doubt drawn by the sunny climate and world-class beaches and golf. 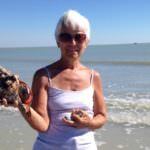 However, one of the most memorable things to do (whether you’re a visitor or a resident) is to get up close to Florida wildlife. 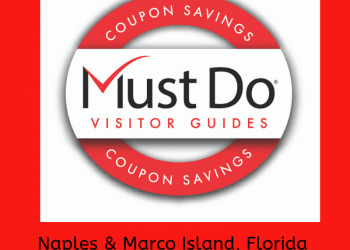 Alligators, manatees, turtles, raccoons, herons, bald eagles, and ospreys are some of the animals you could possibly see on a guided Manatee Tour or Eco River Tour in Southwest Florida. 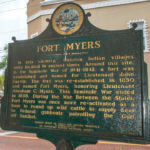 Another way to enjoy the spectacular scenery along the Caloosahatchee River in Fort Myers is on a relaxing Sunset Cruise. 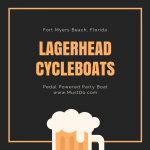 All these cruises take place on the stable M/V River Queen pontoon boat which comfortably carries 42 passengers, two experienced crew members (captain and wildlife narrator), and any well-behaved dogs! These unique wildlife safaris take place along the Caloosahatchee and Orange Rivers, where manatees (the original Florida snowbirds!) head to in winter to enjoy the warm waters. The best time to see these rare mammals is from December to March. They hang around the warm outflow from the Florida Power and Light power plant into the Orange River in huge numbers during cold snaps. 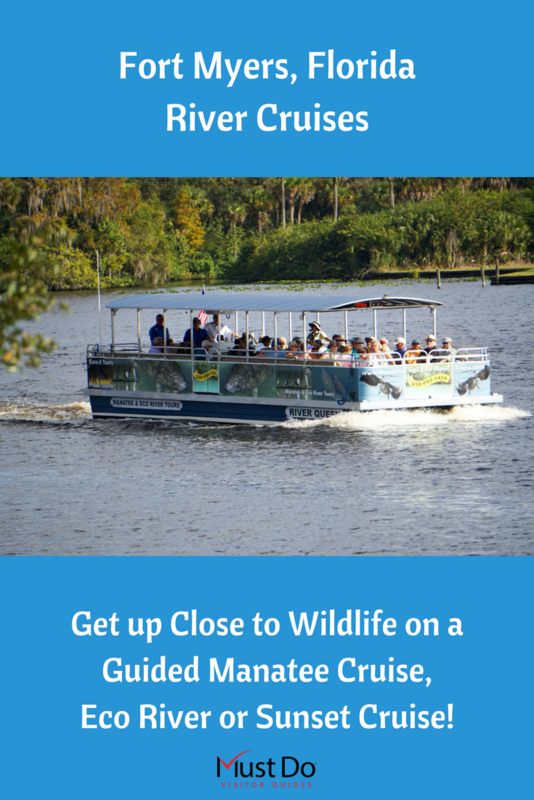 Book your seat on the M/V River Queen and look forward to an amazing opportunity scouting for manatees, sometimes with their young swimming alongside. Look for light bulky shapes just below the surface of the water, or perhaps spot a whiskery snout breaking the surface of the water to breathe. The captain will ease the boat gently towards the sighting so you can take photographs and watch these giant creatures feeding on sea grass on the riverbed. These Florida Manatees, also known as sea cows, are related to elephants. They have thick gray-brown wrinkly skin, large flat tails, and front flippers for steering. Calves weigh 60-70 pounds and measure 3-4 feet and adults can reach up to 11 feet in length, weighing around 1300 pounds. Despite their size, manatees live on a vegetarian diet. Previously endangered, the biggest threat to these slow-moving animals is speeding boats. They can easily be injured by boat propellers as they move slowly and have no sense of fear. Fortunately, our eco-friendly tour boats are fitted with propeller guards and they respect all speed restrictions to prevent any risk of injury to these docile creatures. These two-hour tours fly by as you spot birds, fish, and Florida wildlife that inhabit these rivers. The on-board commentary will be by a Master Naturalist, researcher, or manatee expert who will be happy to answer any questions. 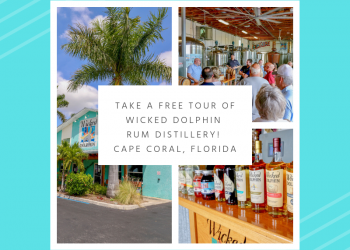 If you are visiting Florida during warmer months, you can enjoy an eco-tour, cruising along these broad rivers and backwaters and enjoying the scenery. 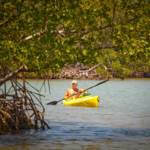 Learn about the cultural heritage of this area of Southwest Florida and spot a collection of animals, birds, and flora. Learn about the construction of the Franklin Lock and Dam, the formation of oxbows, the draining of Lake Okeechobee, the changing wetlands along the Gulf coast and what that means for local wildlife. 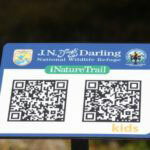 Each tour is totally unique and every visitor will be fascinated by the sights and information. 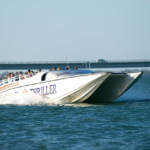 Manatee Cruises, Eco River Cruises, and Sunset Cruises all depart from Sweetwater Landing Marina in Fort Myers, about 20 minutes’ drive from downtown. 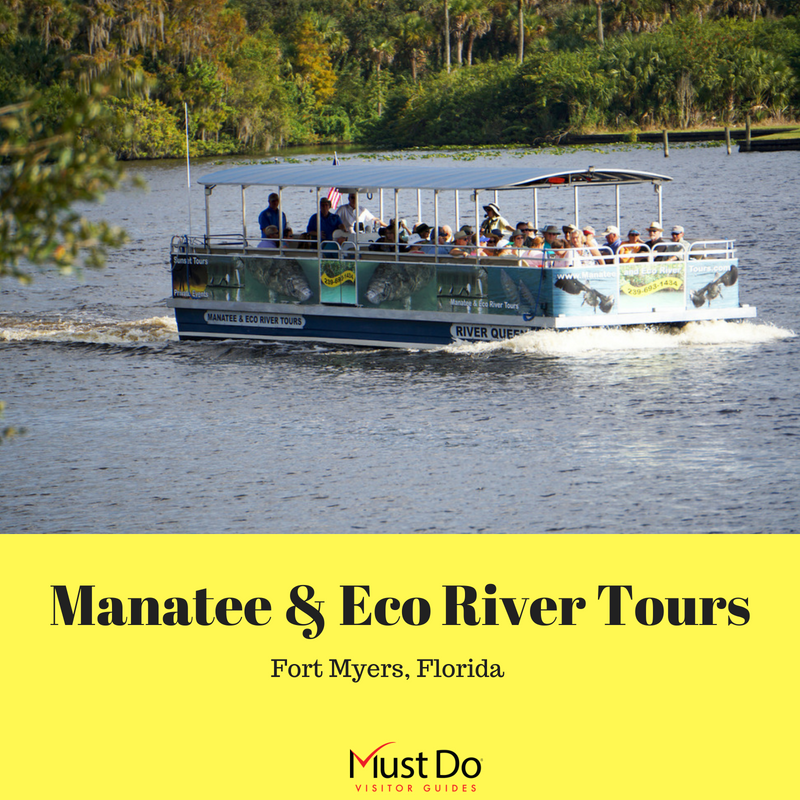 Be sure to include an eco-cruise on the Caloosahatchee and Orange Rivers with Manatee & Eco River Tours on your Fort Myers, Florida vacation agenda.